When I graduated from college as a student of Interior Design...I was set to decorate the WORLD! Little did I know ..my journey would take a totally different path to marriage, then children, and to educate the minds of young children. With all my heart, I KNOW that the Lord placed me where I was supposed to be and in HIS time. Yet, I maintained my design work throughout the years as well. The MASTER DESIGNER was honing my talent, experience, and, most certainly my knowledge, maturity and patience within his timeline. I had the honor of placing period pieces as well as decorating this new home to the Alabama Association of Justice on Perry Street in Montgomery, Alabama. 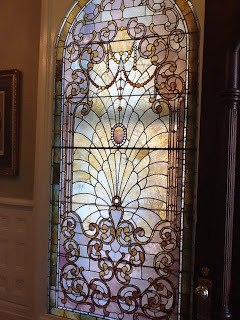 This exquisite stained glass window is original to the House of Mayors in Montgomery, Alabama. I will be adding other pictures of Pickwick pieces, paintings, and bronzes that have found a new home. Pam Klepper Sexton Designing Details…WELCOME! My name is Pam Sexton, Interior Design Consultant for Pickwick Antiques. Our main store is located in Montgomery, Alabama. Our other locations are located in Atlanta at the Stalls on Bennett Street and Pepper Place in Birmingham, Alabama and our new location in the Birmingham Interiors and Antiques in Birmingham(Vestavia). I love to imagine where certain pieces in Pickwick Antiques have been in history....what their story would be...I also like to know where these pieces go. 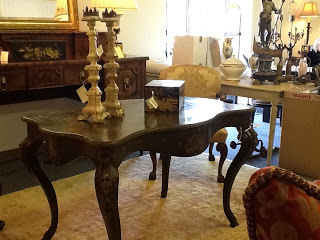 This beautiful table is one of those that I would love to travel to see in its new home.This beautiful table, with exquisite hand-painted classical details is well on the way to be a lovely lady's writing desk. The client selected this piece for her private study in her home in Rome, Italy. CHINOISERIE? More or Less about the term. I have never allowed a "word" intimidate me. (OK, maybe a mathematical term.) However, the term, "chinoiserie" could definitely be one that looks and sounds imposing. Allow me to break it down for you.